What a week. This has seriously been such an exhausting couple of days, but so wonderful and what I've been wanting for my life for as long as I can remember. I can't even decide if I'm happier about being in Europe or being a teacher! The plane ride was long but went well. Everything was on time, luggage arrived, etc. The one exciting part was that because of the orientation website, I knew a newly married couple was coming to teach from Rochester. When I saw two youngish looking people from the Rochester plane to Newark at the Milan terminal, I asked if they were teaching at the same school and they were! They, as well as the 15 other new teachers, ended up being so nice. I know it's still early, but I'm hoping all of my worries about being the youngun' of the group (I am, but not by as much as I thought), the only single one (I'm not, but the 5 married couples are great! And only one has a kid, and the daughter loves me), and the only new teacher (I am...) were for nothing. When you're living abroad, you bond quickly because you all have something so important and huge in common. Everyone misses their family, is confused and lost, so excited, and unsure about everything from getting a phone to the language to getting around town. But my group of new teachers really seem great. They're all so accomplished and most have already been so many places and done such great things with their lives! What was surprising was that after traveling for 9 hours, instead of heading home to rest a little and get settled in, we started right away touring the school, talking to the director and one of the principals, and meeting people. I think they've been trying to keep us busy to keep our minds off of being so far away from home and to help get over the jet lag- if we're busy all day, we're forced into a new sleeping pattern! When I finally was brought to my apartment, I'm happy to say it's even more amazing than I could have guessed from the pictures. It's huge compared to my teeny little dollhouse in Alfred! I'm as settled in as can be without my shipment (it won't arrive for another few weeks), but I don't even have to use the Spork and collapsible bowl I packed because the apartment really is fully furnished- dishes, pots, pans, decorations... None of it's really my style but it is pretty and I like it for now. And there's so much storage space so I can put it all away when my stuff gets here! Woohoo! No pictures now, but I'll add some when the rest of my things arrive. 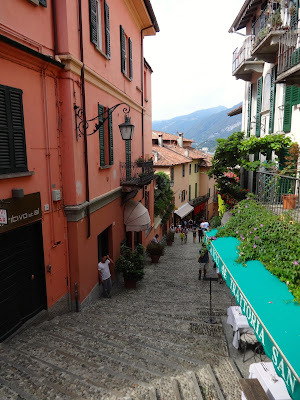 Bellagio on Lake Como was amazing! One of the nice things the orientation committee has been doing is meeting us close to our apartments to walk to school together. Thank goodness, because I am the absolute worst at directions and while the walk is nice, it's been taking 30-40 minutes with a couple of confusing turns, and I'd really rather not get lost when I'm this new! The school is incredible. I don't know how I'll ever be able to teach anywhere else! I might have mentioned this in another post, but the school is about 50% Italian students, and the other 50% come from around 52 different countries. While the foreign students tuition is typically covered by their parents companies, the Italian students are paying roughly the equivalent of two years tuition at a SUNY College each year. I've been told that there are students with body guards who wait outside all day, and that my absolute favorite movie star and idol's grandson is a student there. The cafeteria is gourmet, the facilities are huge and beautiful... It's absolutely amazing. The best part is that the other teachers I've met and the administration are so kind and helpful. I can't even get into it because I'll go on and on forever! My classroom is nowhere near finished, but when it is I'll post pictures. It's going to be so cute! An Italian tradition (for lack of a better word; I don't know that it really is a tradition exactly!) that I've been loving is aperitivo. At an aperitivo bar you'd buy a drink (usually 6-10 euro so pretty expensive), but then have a buffet of appetizers to help yourself to for free! So far we've been to three; two at teacher's houses and one at a bar and they've been so good! Some of the teachers who've been in Milan a while and the principals have been coming, so it's been great to have a casual setting to get to know them in. Any school where the principal takes shots of limoncello with the new teachers sounds like a good place to me! All of Bellagio was like this- so amazing! 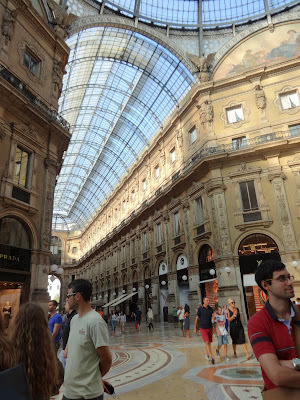 Yesterday's aperitivo followed our first jaunt into the actual city of Milan. When I signed the contract with my school, I read every article and blog I could find on the city, and it wasn't good at all. Everything said it was an ugly, boring, un-Italian city, with too many big business and not enough Italian personality. I wasn't expecting much and was so happy to be proved wrong. The parts that we saw were beautiful! At one point, we were walking on a covered sidewalk with pillars that obstructed the view to the side and someone mentioned that the Duomo was right there. I couldn't see it because of the pillars, and because that's basically all that comes up on GoogleImages when you search Milan, I wasn't expecting to be all that impressed (I thought I was a little desensitized). When I finally caught a little glimpse between the pillars, it literally took my breath away, and I practically ran for a better view. It's so huge, so white against the bluest sky, and every bit is so intricately designed that pictures do it no justice at all. That and the Navigli region were by far my favorite parts. 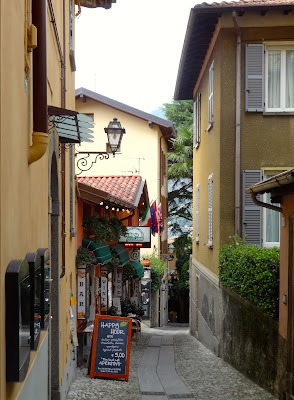 It was an almost Venice-like canal lined with adorable shops, bars, restaurants, and apartments and the narrow, cobblestoned streets were full of artists painting the scene. 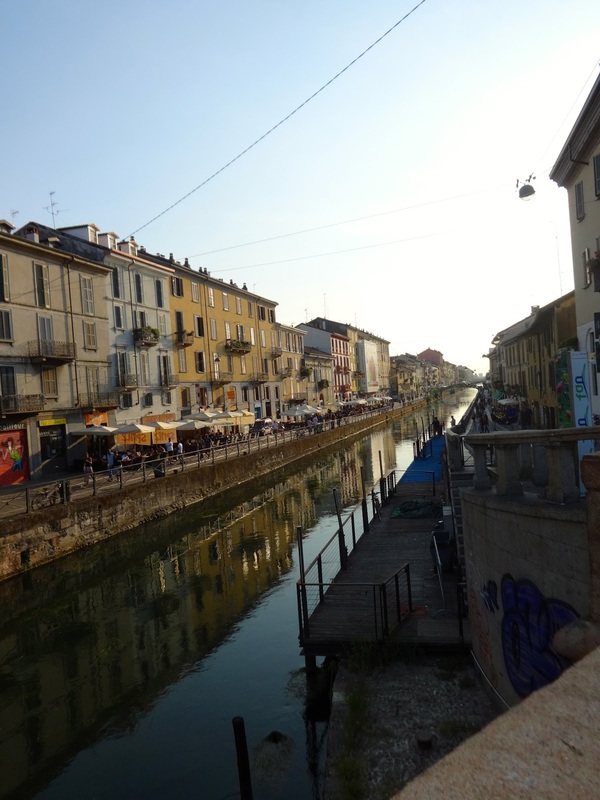 Apparently, Da Vinci planned a whole network of canals throughout the city, but then Mussolini decided (like a big dummy) to cover them up, which could be why its so humid in Milan! Today we hit Lake Como, the land of George Clooney. Bellagio, on one of the arms of the Y-shaped lake, was amazing, beautiful, etc., etc. 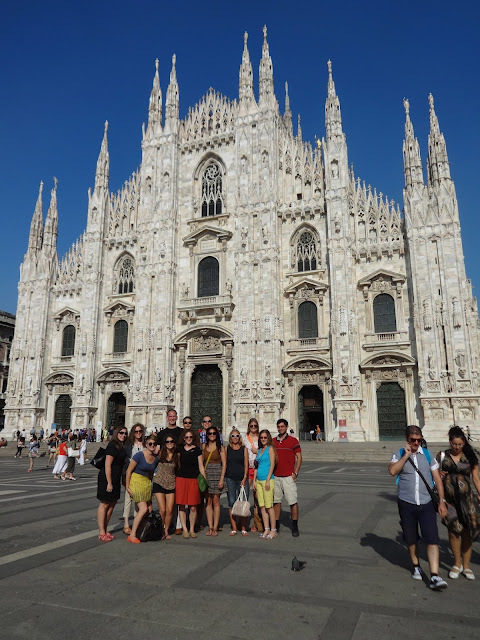 The group and I at the Duomo! Currently, I'm a little out of it (I think I'm allowed to blame jet lag for another week), but really my eating is about as off as my sleep. It's about 11pm, and while I wasn't hungry at 7:30 (I got home early today! Woohoo! ), I'm now starving to death and making myself some penne. I thought I'd be fancy and Italian with some wine, but the cork crumbled and I had to push it into the bottle with the end of my wooden spoon. I sifted most of it out but had nothing to put my wine back into but a Tupperware. Just keeping it classy. Tomorrow we're going to IKEA to pick up things we may need, going on a walking tour of Opera, and then a fancy-shmancy dinner with some of the teachers and administrators. It'll probably be another long day, but I wouldn't trade it for anything!